A 14-year-old boy and his older brother were hired by an agent from Bihar under the pretext of getting them a job in a shoe factory in Uttar Pradesh. The agent brought with him a dozen-odd to Uttar Pradesh under the pretext of offering work to them in a factory. 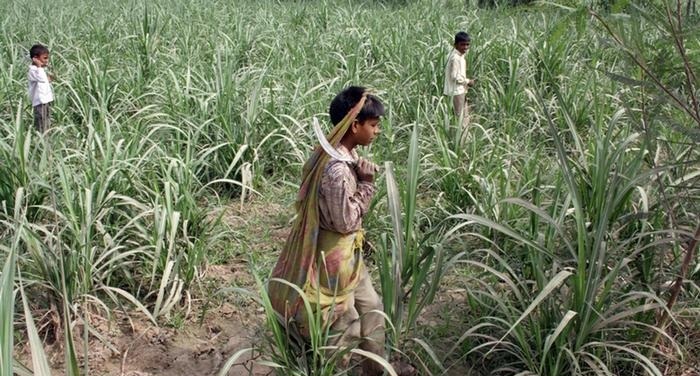 Only upon arrival in Muzaffarnagar, the boys were told that they would be working in a sugarcane field. The farmer who hired the two brothers upon knowing that they have been cheated agreed to release both of them if their families could pay back Rs 10,000, which he had already paid as commission to the agent. Since the family did not have the resources to return this money, the younger sibling was left behind to work and compensate for the commission paid to the agent. The boy had to agree to work at a meagre salary of Rs 2000 per month, with a total of five months of unpaid work, to repay the commission, says a study, which cites the incident as an example of prevalence of child labour in Uttar Pradesh. Released by the high-profile NGO Oxfam India, and titled “Human Cost of Sugar: A farm-to-mill assessment of sugar supply chain in Uttar Pradesh”, the study quotes farmers as stating that “children in the age group 12-16 years, are brought by labour agents from Bihar, Chhattisgarh, and Madhya Pradesh”, adding, they are “are either unpaid or underpaid”.